Over the past weeks, the six CBCA Short List Early Childhood books were read to each class from Kindergarten to Year 2. 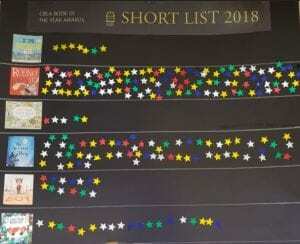 The children were shown the voting chart at the start of the series of lessons and looked forward to voting for their favourite book. The voting chart was very exciting and lead to many hot discussions. It also helped to explain the Book of the Year and Honour books and how special it is for a book to have such an award. The children are thrilled when they find other award books in the library collection recognised by the shiny award sticker. ← Previous Post Do you recognise these book characters? Next Post → CBCA NSW Eastern Suburbs Sub-branch Children’s Event!